First steps on the new Ducati V4-R, first team-building test, first laps to help the rider to remove the residual rust from the cold winter months. After so much waiting and so many gossips the masterpiece of engineering from Bologna is on the track. All this happened during the two days of testing just ended at the Jerez de la Frontera circuit. 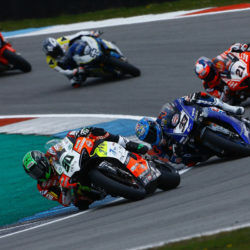 The track presented itself with a new and slippery asphalt to be discovered, a factor that has slightly complicated the tests during the first day, but has nevertheless allowed the WorldSbk riders to carry out the pre-set work program! During the first day of the test, Eugene looked for the right position on the bike, starting to feel the reaction of the powerful V4 in his hands; even the guys, under the watchful eyes of the Ducati’s technician, gave their best to understand the operation and the changes that could be implemented on the Red of Borgo Panigale. Only 35 laps made, as per the initial plan, but the Northern Ireland ace has immediately felt the great potential of our bike: the gearbox and the engine are truly impressive! The latter releases an incredible power that must be managed in the best way to be exploited in each of his horsepower. On the second day, after having been closer to the top, our first technical components were builded: Bitubo suspension and Galfer brakes. Eugene felt immediately comfortable, confirming the high quality of our partners’ products, even signing the best time of the day in the evening, in conditions of cold asphalt, not optimal, race tyres and full of gas. To conclude, after only two days on the bike at 1.7 from the Kawasaki of Rea is really a good start! The help provided by Ducati technicians was also really important: wonderful people, able to instill all the Ducati racing experience. who explain every little detail with the calm and precision required! 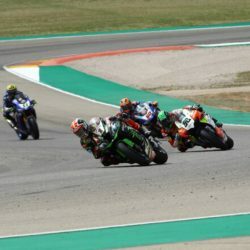 This two days on the Andalusian circuit has given even more confidence to the rider and the team, but the way to the perfect set-up is still long. 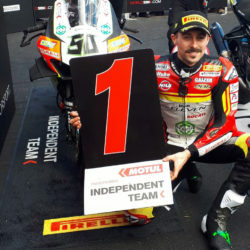 On 27-28 January in Portimao Team Go Eleven and Eugene Laverty will be on track with all the latest changes to improve the lap time getting closer to the top positions!